Here the bitter cold and the fading dreams of utopia play the leading roles. Someone lost her skates and somebody else returns them. You build a park based on your life, where you know every detail, every story of the tiniest twig in the park. But everyone else sees only birch trees, a rose garden and grass. What should you do? Put up signs with information? Have guided tours? 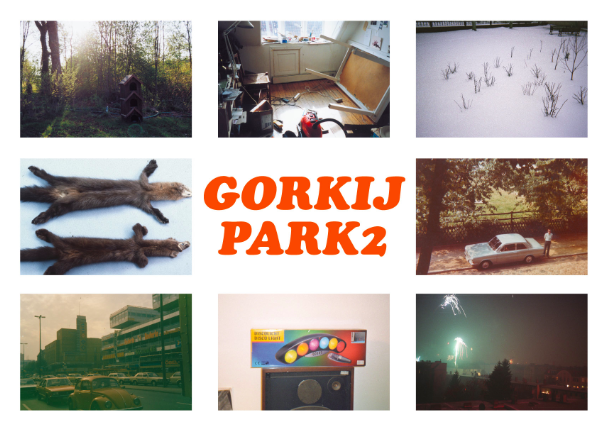 “Gorkij Park 2” is a completely independent sequel to the 80’s thriller Gorky Park, a Hollywood story with the KGB in fur hats, filmed in Helsinki due to the cold war that was going on at the time. This show takes its starting point in the film and deals with forgotten utopias, social realism and a curiosity about what really happened at Fjodors’ party. Had some guests actually glitter around the eyes? Besides from the trouble of building a park based on someones life and trying to base a piece on a movie nobody seems to remember, we are doing fine. “Gorkij Park 2 ” is a place for recreation or a white board with arrows or just the longing for the world to be a better place. The premiere will be at Göteborgs Dans- & Teaterfestival, Gothenburg, the 14th of May. We call this particular preview the black and white version of the show and the technicolor version will take place in Gothenburg. Concept: Gunilla Heilborn. Choreography & text: Gunilla Heilborn together with Kristiina Viiala, Johan Thelander, Henrik Vikman et al. Sound design: Franz Edvard Cedrins. Light design: Miriam Helleday. Set design and costumes: Katarina Wiklund. Co-producers: Göteborgs Dans- och Teaterfestival (NXTSTP), Steiricher Herbst (NXTSTP) and MDT. This project is co-produced by NXTSTP, with the support of the Culture Programme of the European Union. With support from Arts Council Sweden, Stockholm City Council and the Swedish Arts Grants Committee.